I was in a wheel chair, had a liver transplant, and with a lot of physical therapy and pain I recovered enough to walk and walk away from SS Disability which I could have easily stayed on the rest of my life. I currently travel extensively but have to take drug tests, have a lot of trouble even getting my Dr’s prescription filled, and while traveling have to drive back home to GA often 1000 miles round trip because my DR already can not prescribe my meds without seeing me face to face. Most Drs insist on seeing a pain management patient monthly. I have issues which restrict my use of Tylenol and Ibuprofen as well so those are not available. Without these meds I would have no choice but to attempt to re-qualify for disability. I am already made to feel like a criminal simply for trying to be a productive worker/citizen and function fairly normally with a little help. Since 2006 when this started I have never once taken more than prescribed, failed a drug test, or failed a pill count which my DR does every time I have an office visit to confirm I have the proper number of pills left for the number of days remaining in that months prescription. *uck the junkies and abusers but current restrictions are already hard as hell to deal with and maybe a little less so for people who do not travel extensively like I do for WORK! I can not take full strength aspirin or Ibuprofen. It thins the blood too much and my disorder comes back leaving me without platelets. I understand somewhat the issues. Why are you blaming the users and abusers? 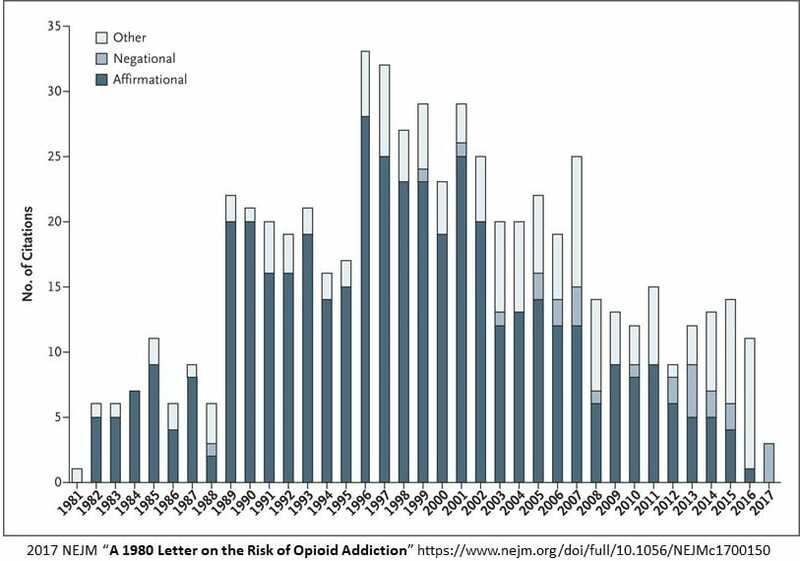 Lets go back to the letter in NEJM which was abused by doctors citing there was no or little danger of addiction. Why not get angry at Purdue who misled doctors on the danger of addiction from opioids. Is it ok for Miami-Luken to dump millions of tablets in two small communities in West Virginia? The current opioid addiction crisis is, in many ways, a replay of history. America’s first epidemic of opioid addiction occurred in the second half of the nineteenth century. In the 1840s, the estimated national supply of opium and morphine could have supported a maximum of 0.72 opioid-addicted individuals per 1,000 persons. Over the next 50 years, opioid consumption soared by 538%. It reached its peak in the mid-1890s, when the supply could have supported a maximum of ∼4.59 opioid-addicted individuals per 1,000 persons. The ceiling rate then began to decline, and by 1920 there were no more than 1.97 opioid-addicted individuals per 1,000 persons in the United States. The rate today? I beleive is some were in the 5s or near it. It is not coming down any time soon of any magnititude and like I said three years of it are equivalent to 20 years of Vietnam deaths. Almost the same story as Garry above, but I am retired and no longer try to be a productive citizen. People turn to the streets because their doctors can no longer provide sufficient pain medication to keep them functioning. The guidelines and the way they have implemented them have my doctor afraid to prescribe any painkillers for my husband, because I can only take opiates and two prescriptions for the same household may get his license suspended. My husband can’t always feed himself, because holding a fork or spoon is too painful. But he can take NSAIDS which I can’t. I don’t know if they are trying to scare doctors into not prescribing or what, but my doctor believes that if a drunk driver runs into me and I am killed, because he prescribes opiates for me he will be investigated for overprescribing. Considering that I have been completely pain free for almost 3 hours in the last 15 years, I guess that is overprescribing. Look at how this all came about and the results. – A letter in 1980-something that said little or no danger. Doctors failed to read the other part of being given in a hospital setting. – The letter being quoted over 600 times from the time it was written till 2015 claiming opioids will not endanger patients. The citations were lies by doctors and the industry claiming there was little danger. – Look at Purdue executives who were found criminally guilty of lying about the addictive effects of opioids. – Look at Miami – Luken who dumped millions of opioid tablets in two little West Virginia towns of ~22,000. – 58,000 died in Vietnam over 20 years. At 19,000 per year in deaths from prescription opioids, we will surpass Vietnam. – Look to industry which spent almost $1 billion lobbying state legislatures. – ~72,000 people died from drug overdoses which is almost 50% of the total accidental deaths in this nation. Lets see what the CMC proposes. Addiction Rare in Patients Treated with Narcotics January 10, 1980. Recently, we examined our current files to determine the incidence of narcotic addiction in 39,946 hospitalized medical patients1 who were monitored consecutively. 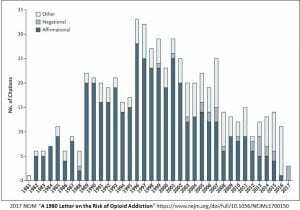 Although there were 11,882 patients who received at least one narcotic preparation, there were only four cases of reasonably well documented addiction in patients who had no history of addiction. The addiction was considered major in only one instance. The drugs implicated were meperidine in two patients, Percodan in one, and hydromorphone in one. We conclude that despite widespread use of narcotic drugs in hospitals, the development of addiction is rare in medical patients with no history of addiction. As someone who takes them to control the horrific pain associated with chemotherapy-induced neuropathy, this includes me. I’ve been on the same low level of opiods for four years now and have never had a problem. Fortunately I’m retired, so the time it takes to jump through the extra hoops it takes to get the pain relief I need is not a burden. If I was still working, however, it would be a real impingement on my time. With the drugs, I might add, I would not be functional. The points I bring forth are not about those who need. You, Jane, and Garry are not the issue here. It is the liar-doctors who used a simple letter to profit by it and expand the usage of opioids well beyond what is needed. It is about Purdue, Miami-Luken, H.D, Smith, etc., who have abused their responsibility to the community as a whole in favor of profits. They and the doctors lied to us. Here comes the AMA claiming doctors should be allowed to medicate even when they lied. I was discussing the use of a new medication with my neurologist and expressed some concern about “dependence.” His reply was that, as a person with Parkinson’s, I am certainly dependent on Levadopa/Carbidopa, right? Dependence is a tricky word. Run, you are correct as I got defensive and lashed out at the abusers because I have been taking these drugs since 2006 and some days I take less than prescribed and try to fight through the pain with less help. I understand addiction as I struggled with alcohol earlier in my life and over came that addiction and anyone who is addicted the first step in to admit it and take responsibility. My point is the laws are already so restrictive that if they tighten the laws any more than they are people like me who don’t abuse the drugs but truly need them to make a productive life will have no alternative but to either live in pain or stop trying and go back on disability. I have to drive from Miami to Georgia and turn around and drive back in excess of 1,000 miles driving because my DR is required by law to see me face to face even though he has been my Dr for years and years. I don’t know what the answer is but every time I read an article like this I think here is another person who truly would like to make the use of these drugs illegal. Run, I was the type person before ending up in a wheel chair who would not take an aspirin or any medicine period and laughed at people who said they needed this or that pill. I ate a lot of words when learning how to WALK again. The darn laws are super restrictive right now and my Dr’s hands are virtually tied on this type prescription. I do not know if they will make them tighter. If you read the 2017 study on the numbers of citations used by doctors in 1980, hundreds of doctors flat out lied and construed what Jinck and Porter said in their letter to the NEJM. Purdue and other manufacturers campaigned on the difference between addiction and physical dependence. I understand the issues; but going back the other way and giving doctors the freedom to do as they please, has not worked and they refuse to take responsibility for being one of the causes of this epidemic. .
Karl, Gerry and I are not the issue, but we have been harmed by every action taken to date. I haven’t seen anything at any time that leads me to believe that any of the people deciding on what actions to take even know that people like us exist. They only see addiction, which they conflate with physical dependence, and decide that cutting off the supply will fix the problem. If they do anything else it has not been effective at fixing the problems of overdose and addiction. I stopped believing they wanted to reduce the number of addicts and overdoses when they came out with the same failed “solutions” for the third time. I know you, Garry, and Karl are not the issue; but it has gotten so bad, they just can not prescribe Opioids the same as Metoprolol, Lisinopril, Prilosec, etc. The doctors have not taken up the responsibility and the corporation are feeding off of the profits made. Purdue flat out lied on the impact of Oxycodone in 1995. Doctors who used that 1980 letter and did not mention opioids were used in a hospital setting flat out lied to. Here are the facts and mostly why we have an epidemic on our hands.